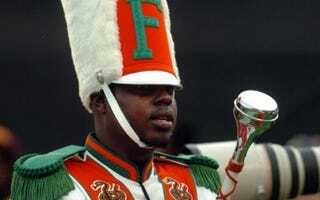 Prosecutors announced Wednesday afternoon that 13 Florida A&M University band members have been charged in the death of drum major Robert Champion. The majority of the charges, ABC News reports, are hazing resulting in death, which is a third-degree felony. If the defendant does not have a prior record, the maximum punishment for the charge is six years in prison. Last November 26-year-old Champion was found unresponsive aboard a band bus after the school's biggest game of the year. Police ruled the death a homicide from hazing. Witnesses told the parents that Champion, who was gay, might have been hazed more severely because of his sexual orientation. "There were 30 witnesses on that bus, and it took six months to even tilt the scales of justice in Robert Champion Jr.'s favor," Sharon Lettman-Hicks, National Black Justice Coalition executive director and CEO, said in a press release today. "The sad reality is that justice drags its feet when a Black life is at stake. There's even less outcry when it is the life of someone Black and gay. That is why we must continue to proactively advocate on behalf of Black LGBT people who are victims of violent crimes." She added, "These institutions develop many of our future leaders but fail to create safe and nurturing environments for all of our young people to thrive." Florida State Attorney Lawson Lamar refused to release the identities of those charged "so they don't flee," ABC News reports. Lamar said more than 20 counts of misdemeanor hazing have also been filed for additional victims who were not seriously injured.